I love polymer clay and I love silicone mold putty. In fact I recently explored the difference between two main brands of silicone mold putty, Easy Mold and Amazing Mold Putty. And if you work with polymer clay, sooner or later you begin to get curious about using silicone mold putty and begin to think about how it works with polymer clay. And if you can use them together. Here are two ways that you can use polymer clay with silicone mold putty. You can use silicone mold putty to create a mold or texture sheet from some object or texture that you want to duplicate. For instance you have a small figurine that you want to duplicate in polymer clay. You would use the mold putty to create a mold from the figurine. Then put polymer clay into the cured silicone mold to create a polymer duplicate of your figurine. These molds were made from snowflake shaped buttons. 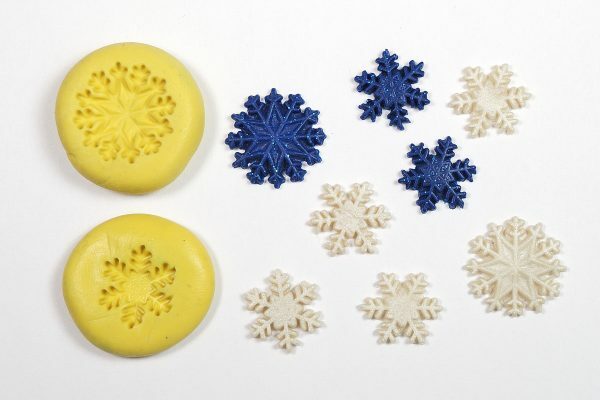 Silicone mold putty makes great molds to create items such as these polymer clay snowflakes. You can learn more about using silicone molds with polymer clay in my article here. I show you how to fill the molds, get a good impression, and de-mold the cast without distortion. The second way is to make an item from polymer clay and then create a mold from that polymer clay object. You would then use the silicone mold to make more polymer clay objects or you could use the mold with other materials like chocolate, wax, resin, soap, or even low melt metal. Seems simple enough and quite straightforward, right? I thought so too. But then a reader, George Cheech, told me that he had problems with mold putty curing when it was used on Kato polyclay. I’d never heard of that before, so I did a quick test with some clay that I had sitting around. And sure enough, Amazing Mold Putty did not fully cure when it was molded over Kato polyclay. And that made me think. Does cure inhibition happen with all mold putties when used with uncured polymer clay? What about cured polymer clay? And does the brand of polymer clay make a difference? Well you know me. I had to find out. To test if silicone mold putty cure was inhibited on polymer clay I ran a little test on both raw and cured clay. And I used both Amazing Mold Putty and Easy Mold. I cut out a circle of every brand of polymer clay that I had on hand and arranged them on a ceramic tile. I used Sculpey Original, Super Sculpey, Sculpey III, Premo, Souffle, Kato Polyclay, Cernit, Fimo Soft, and Pardo. All colors tested were white except for Super Sculpey (which is flesh colored) and the Cernit and Pardo which I only had in translucent. I then mixed up some Amazing Mold Putty and some Easy Mold and put a little ball of the uncured mold putty on the uncured polymer clay circle. Then I waited for them to cure (about 30 minutes or a bit more). I ran the same test on cured circles of the same polymer clays. According to my test, if you’re going to make a silicone mold from polymer clay it will work best if the clay is fully cured first. Making a silicone mold from unbaked polymer clay did not work well with most clays and with both brands of silicone mold putty that I tested. Creating a mold from Kato Polyclay and Cernit, even when the polymer clay is baked first, did not result in a complete cure of Amazing Mold Putty. In short, make your silicone molds from baked polymer clay. And if you’re going to use Cernit or Kato polyclay, you must not only bake the clay first but you need to use Easy Mold instead of Amazing Mold Putty. I only tested two brands of silicone mold putty and there are many dozens of brands of this material, each with their own characteristics. I can’t make any judgement about the cure inhibition of those brands. But my test does suggest caution when using Kato or Cernit. And that you should not expect good results when making a mold from uncured or raw polymer clay. Always test your materials first before devoting hours of time and effort on a project only to have it ruined by incompatibility. I see no reason to expect that cured silicone molds will cause any softness or problems when used to create a polymer clay cast. So feel free to use mold putty for making molds and texture sheets that you will use with polymer clay. This is a time-tested method and works very well. Thanks for the most helpful article on mold putty. I am so glad your curiosity drives you to do these very thorough tests. And that you are kind and generous enough to share your findings. Thanks for another great post. My kids would not agree that I’m kind. But that’s okay. I’m always happy to share what I find out. I love reading about your tests… so interesting, informative and helpful! Thanks for, once again, sharing your experiment results with the rest of us! You are so scientific in your approach to these problems. Bless you for sharing your investigations! I found this very interesting. I have a question, though. When would you use uncured polymer clay for molding? It seems all detail would be lost, defeating the purpose. Well in general, I agree with you. Like I said, it’s not something that I came across. A reader pointed it out. But I was surprised, though, that even using cured Kato and Cernit caused a problem with AMP. So it’s just one of those things that needs to be “out there” for people in case they run into the same problem. As for losing detail, mold putty is quite soft and if you’re using a fairly stiff polymer clay there won’t be detail lost. I have actually made texture sheets by pressing things into raw Sculpey and then applying mold putty to that. It worked. And I could re-use the Sculpey. But next time I’ll cure it. I have the same question as scooey7. If i’m taking the trouble to form something out of polymer that I think I might want to make in quantity, I always cure it before making the mold. For 2 reasons – first (as scooey7 said) so that the details I’ve made will not be lost, and second – to have the polymer positive as a Master, so that if the mold is damaged or lost or loses detail, I can make it again! You’ll also find that rubber stamps inhibit curing, so that if you are taking an impression from a stamp, the easiest way to do it is to make a polymer impression and then make the silicone one from the cured polymer one…..
Ah, I was just answering scooey when you posted. I agree, mostly, and you bring up a very good point. But like I said in my answer to her, you might run into this if you’re making a texture sheet from something that’s too small to create a mold from, and you’re just using the polymer as a putty or dough rather than something you want to save. Also, if making a mold from cured Kato or Cernit, the cure is still inhibited if using AMP. And that result surprised me. That tidbit about the rubber stamps is a huge one, though. Thanks for the reminder. More tidbits of information for my mind to wrap around! When making molds, I have not tried to make one with raw clay – always baked. I just love your experiments – how thorough you are and how much time and effort you save us! Big thanks! I haven’t tried either of those brands of RTV (room temperature vulcanising) silicone but have used a few others, and have found that other things inhibit curing too (e.g. various release agents). The age of the silicone is also a factor. What I have heard, but haven’t tried personally yet, is that when curing is inhibited it can be helped along by heating it. That’s really great to know about using the heat. I’ll try that if I run into this again. I know that heat works well to fully catalyze sticky resin, too. Alumilite gave me the best results. Granted, I wasn’t testing per se, but I felt there is much more definition. My problem is finding craft stores that either stock it or keep it in stock. I do like AMP. But find I lose some definition with EM. Just my experience. Isn’t that funny how we got such different results with AMP vs EM. I thought just the opposite. But it was kind of subjective and the difference was small. Who knows. They’re both great products, though. Can you order Alumite directly from the company? Amazon sells several types of Alumilite. Could you be more specific? Are they all liquids? I’ve tried three different brands of putties: Amazing Mold, EasyMold and Aeromarine Platinum Silicone Molding Putty on Kato polymer clay. If the putty dries, it has tiny little bubbles in it, so it’s having some kind of adverse chemical reaction. All of them worked fine on metal objects. I now realize Kato brand is the problem, not polymer clay in general, so thank you, Ginger! I also tried Sculpey Bake and Bend to make a mold and it doesn’t bend or I did something wrong. I have several rubber stamps I’d like to make the opposite of in something rubber-like in one step. Kato polymer clay is too hard and stamp ink beads off of it. None of the putties above worked with rubber stamps, however the liquid rubber OOMOO 30 works pretty well. I make a little dam with tape around the edge of the stamp and pour the liquid on top of the stamp. The result is very detailed, but softer than I’d like, so I’d like to find something a bit stronger, more rubber stamp-like, if anyone knows of a product. I’m thinking of trying Mold Builder Liquid Latex Rubber that you paint on in layers. I bought the Art Clay World 5 minute cold molding compound and I love it I have not used it on un-backed polymer clay but I have used it on my backed pieces and not had a problem and I love the fact it’s cured in five minutes 🙂 which gives me time to make a cuppa while its curing and it’s ready to use once my coffee is made and I am back In my seat 🙂 oh I bought it from Fire Mountain as I had seen a video of it being used and I was not sure of all the other brands as I was not able to find a video clip on how to use them. Just want to be clear here, make sure I understand. So I make a clay item, bake it, use Easy Mold to make a mold of the baked item, then later use this mold to bake a new clay piece in the oven. I just want to make sure I can bake the mold, I thought I had read that I couldn’t but now I think I misread the directions and as luck would have it, I threw them out. Yes, you can bake molds made from silicone mold putty. They are heat safe up to right around 395°F if I recall correctly. You could check the manufacturer’s website for more specific instructions. That is very good info…thank you!